Use these apps on a daily basis to prevent information overload and organize your life. 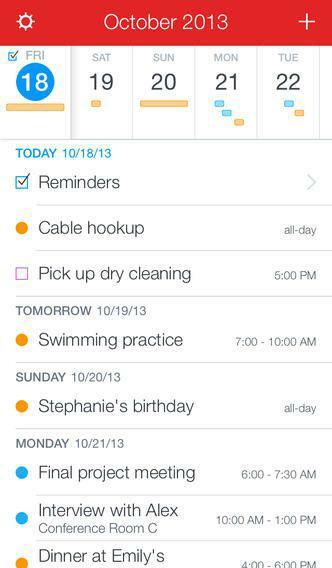 tEvernote syncs all your notes, to-do lists, reminders and more across your devices. Everything is in one app, accessible from all your platforms. My favorite part is the searchability in Evernote. I can save a recipe and search by ingredient later. If I want it to, it will add the ingredient to a grocery list (Evernote.com, free). tCheckmark reminds you of things on your to-do list based on your time and location. I’ve been known to read about a shop that intrigues me, so I type the address into this app. Next time I’m close to the location, it reminds me to check it out. Or, if I’m running errands in a certain part of town, it reminds me that I also need to pick up my dry-cleaning around the corner (iTunes, $10). t Any.do is like having the nicest life coach in your pocket at all times. With voice recognition and predictive texts it furthers the feel of working with a real person to help you stay on top of your agenda (www.Any.do, free). tDropbox is basically storage for your files, photos and data that you can access anywhere. You can also use it to share files when collaborating. Above all, it gives you peace of mind that if you lose your device, your info is secure and available off-site (Dropbox.com, free). t Fantastical 2 is a calendar app that also syncs reminders and to-do lists, and interfaces with audio notes as well. If you’re like me, you love your iPhone, but hate the calendar. Here I can see a week at a time if I rotate my phone to landscape. I can easily create alerts by saying “remind me tomorrow at noon.” Easy to use, and considering how often we all use our calendars, this one is imperative (iTunes, $3). t Sometimes more is better, but I’ve found that by condensing the majority of my apps to these basic five, my productivity has increased and my feelings of being overwhelmed have decreased. Win-win.